After seeing Suicide Squad back in August I completely fell in love with Harley Quinn’s look. 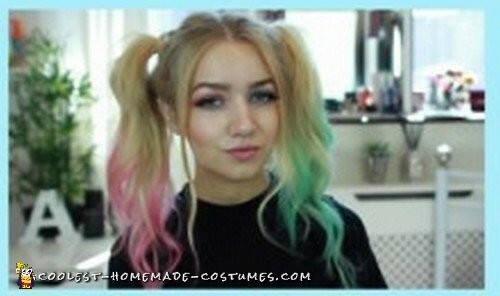 Her mismatch bunches and quirky eye makeup looked great and I thought it would be a really quick and easy costume for Halloween this year. I clipped my hair extensions in. Next, I separated my hair into two sections for the pigtails. First, creating a centre parting and then taking that all the way back to the nape of my neck. I took one of the sections and pulled it up into a high pigtail on the side of my head, slightly higher than where I wanted it to sit when I was done. I secured it with a hair tie and then did the same on the other side. Then I draped an old towel over one shoulder and grabbed my blue hair chalk. I just took random, small sections of hair from my pigtail and rubbed the chalk down the length of the hair, starting just under halfway down the hair. I carried on until almost all of the tips of my hair were chalked blue. If you’re going to try this look, make sure you use an old towel. It was a bit of a mess I was done! Next, I moved the towel over to the other shoulder and grabbed my pink hair chalk. I repeated the whole process on the other side, making sure I got good coverage by separating the hair out now and then and going back over it. The next step was to add some waves to my pigtails for that messy, grungy look that Harley Quinn rocks so well. I simply took random, small sections of hair from my pigtails and wrapped them around my curling wand for a few seconds. I only wrapped the tips of my hair around the wand as I just wanted to wave the ends. I gently separated my waves with my fingers and backcombed small sections to make it look super relaxed. Now for the makeup. I didn’t do anything complicated here, I just swept a pink eye shadow over one eyelid and a blue eye shadow over the other. Harley Quinn’s makeup is deliberately messy so there was no need to be precise. And that’s it! I threw on some short shorts and a bomber jacket I already had, grabbed a baseball bat and the hair and makeup did all the work! 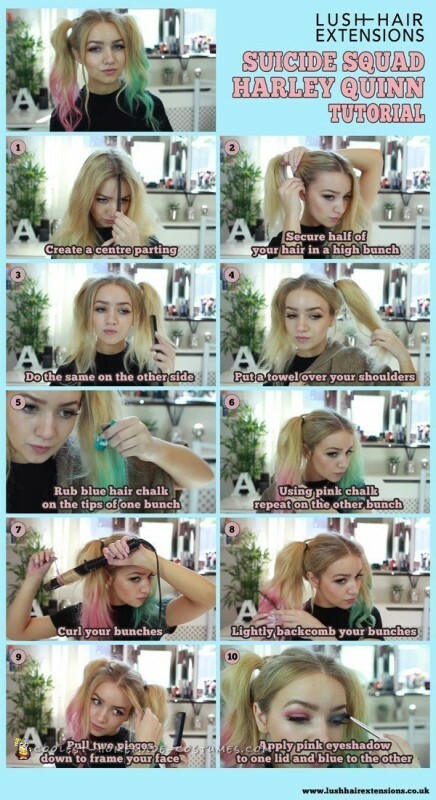 Super easy Harley Quinn tutorial.